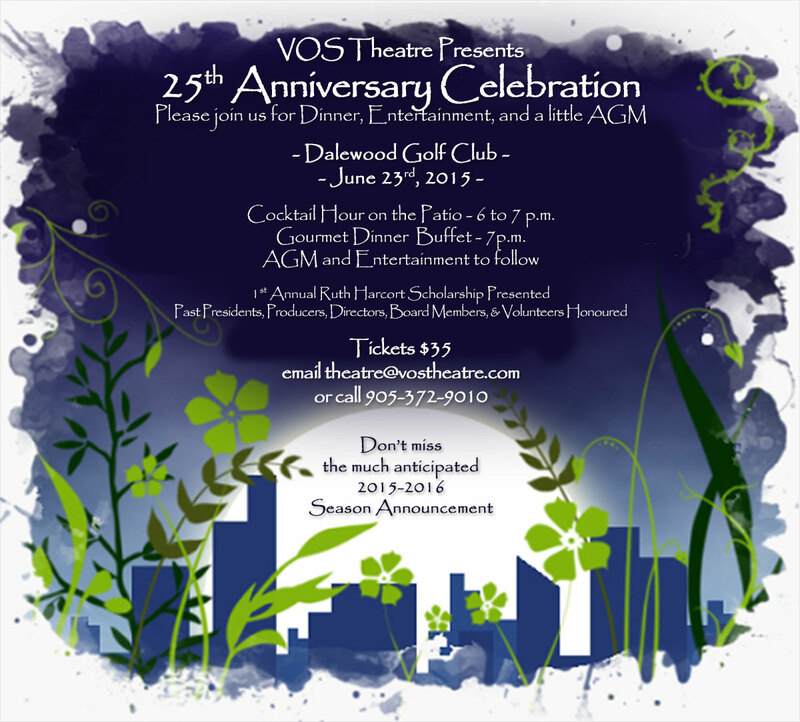 At the VOS 25th Anniversary Dinner & Annual General Meeting, Executive Producer Florence Fletcher was pleased to announce the 2015-2016 Season. I believe that people will be surprised at the range of shows and opportunities we will be offering to our members. We have been able to secure the rights for some amazing shows – there is literally something for everybody. We will be continuing with our Play Reading selections again this season, a great way of exposing ourselves to new works and to Canadian plays that we might not otherwise have an opportunity to experience. 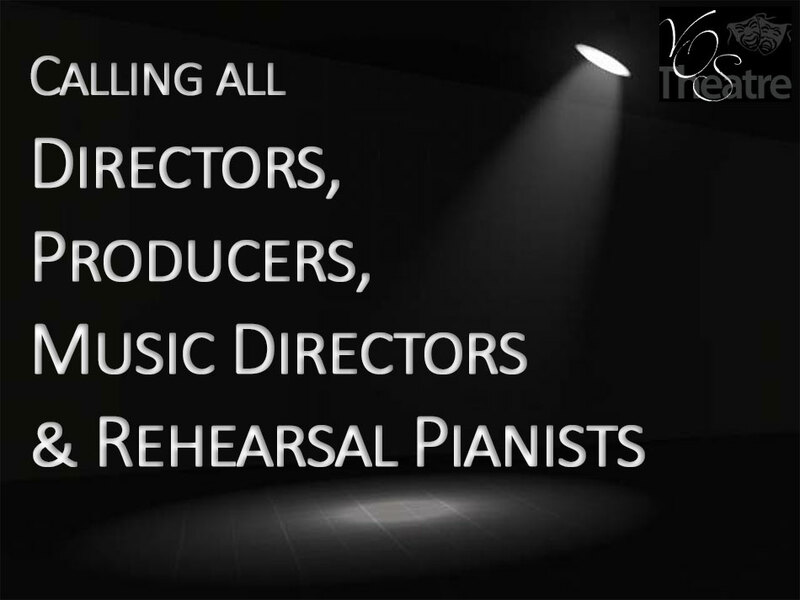 Check the VOS Theatre website often for updates on Auditions and Volunteer information. You can also follow us on Facebook or Twitter to make sure you don’t miss any information. The play reading series with Bea Quarrie and Friends will continue and expand this season, with 4 dates to look forward to in September 2015, October 2015, March 2016 and May 2016. August Osage County, by Tracy Letts is heralded by many as a contemporary American classic. In the grand tradition of plays that reveal destructive forces within families, August, Osage County spins a Shakespearean tale of three daughters and their families returning to their father’s home after his funeral. Repressed anger spills over into rage, as revelations, disclosures, ancient grudges are revealed, sparks fly and some ignite, but thankfully, much of this searing tale is leavened with black humour. This play opened in 2007 in Chicago and was lauded by critics after its New York opening as the most exciting new American play Broadway had seen in years. In doing research about Sir Arthur Currie, playwright Hugh Brewster came across excerpts from the famed 1928 libel trial which impressed him with their dramatic potential. The courtroom scenes in Last Day, Last Hour incorporate actual dialogue from the transcripts of the trial. Singer and songwriter, Francine LaSalle, leaves her philandering partner, theatrical agent Alan Fairfax, to become a small-town singing teacher. She gives her three students versions of her only published song, I’m Not Through With You Yet. When Radio Station CFQJ announces its “Small Town Big Talent Contest” in Kraymer’s Corners, all three enter hoping to win. Allan, who has kept trying to contact her, shows up as a judge, infuriating Francine. Contest results spawn surprising new romances while Francine’s unexpected good fortune mellows her animosity but not her need for independence. By The Skin of Our Teeth, by Thornton Wilder is an absurd comedy that reflects today’s absurd global condition. In the play, civilization is almost destroyed three times- by ice, then by flood, and finally by war. Values of the past are outmoded, but we are reminded that we are always free to choose our values and create a new world. Sabina, Wilder’s lead character, takes on the role of the conventional comic maid who is at once the family confidante, the siren who threatens family solidarity, and eventually the peacemaker who restores balance in the world. Sabina also breaks convention to guide the audience through the banalities of school days, family life, and urban turmoil. Mr Antrobus, the lead male character, is ready to start life over again at the end of the play with some vision that might guide us all into the unknown. Wilder, who wrote Our Town, is never preachy or didactic, but offers humorous and intelligent social and philosophical comments on our current plight on this planet. 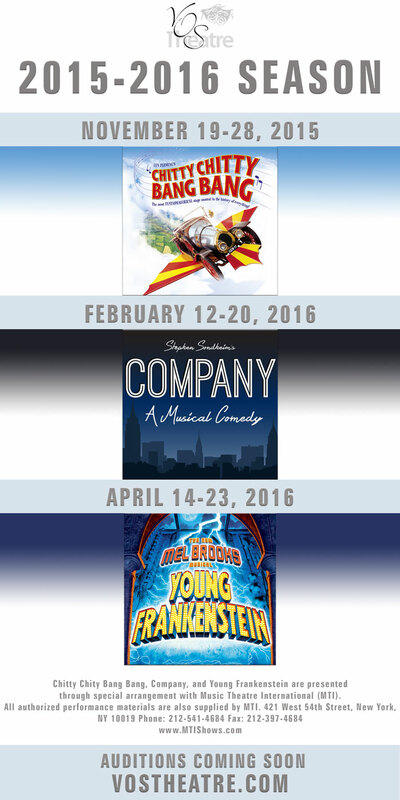 VOS will produce a ground-breaking 3 musicals this season, with dates in November 2015, February 2016 and April 2016. The 25th Anniversary Dinner & AGM is 2 Days Away!